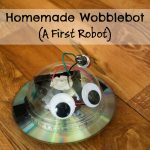 A few weeks ago I published a post on how my family made an animal cell model. 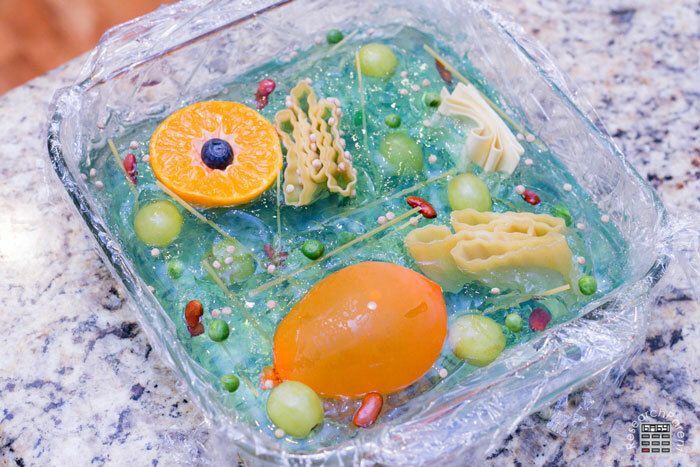 We actually made a plant cell model the same day. Plant and animal cells are very similar. There are a few key differences, however. I’m planning to do a post soon explaining how you can use these models to explain these differences. 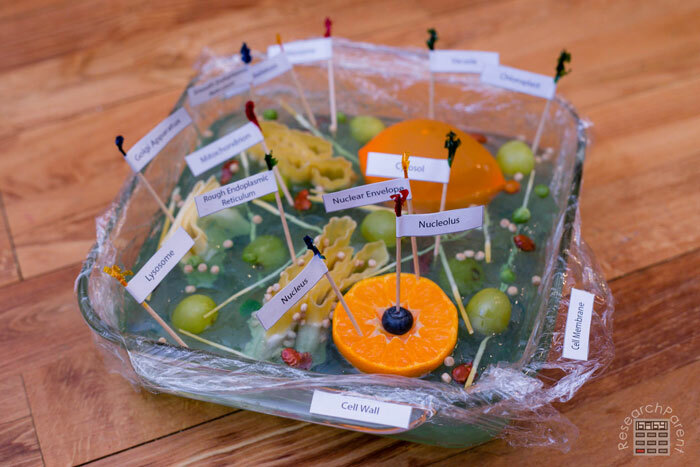 The primary difference is that plant cells have an extra type of organelle called chloroplasts (the green grapes in my model). This gives plants their green color and also allows them to undergo the process of photosynthesis. My 8 year old and I both got pretty confused when we were studying plant cells. With animals, whether or not something is alive or dead is pretty well defined. With plants, however, it is less clear. For example, my son asked if a potato in our pantry was alive or dead. What about potato chips? The inspiration for his difficult questions were this episode of Bill Nye the Science Guy. I actually didn’t know. I’m still not 100% sure. A plant that is growing in the ground is definitely alive and has living cells. I’m also pretty darn positive that potato chips are not alive and do not have living cells. I *think* a potato in my pantry actually is still alive in some way. They occasionally sprout if I leave them too long. If I planted them in the ground, they would grow. So my best guess, is yes, potatoes in the pantry are alive or at least have some living cells. Then he started asking me even more confusing questions like, what happens to dead cells? Do they disappear or do all the organelles just stay there, but stop doing things? My response, “Great questions, buddy. I have no idea.” Maybe one day I’ll understand the intricacies of cell biology. Maybe he’ll go to college and study biology. For now, I’m just glad my kids are asking questions. 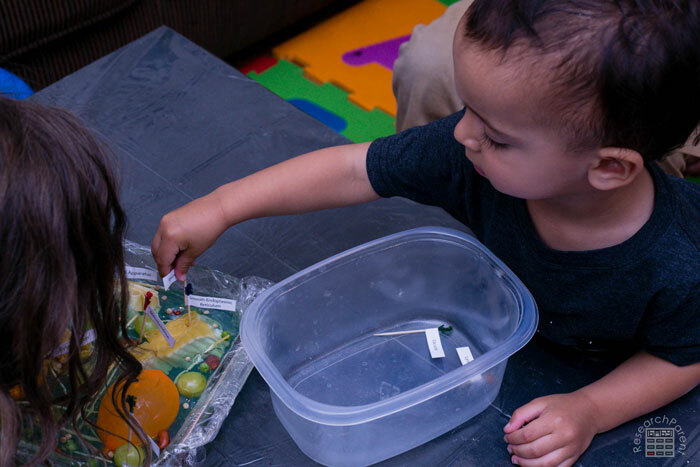 Curiosity is the most important part of learning, in my opinion. 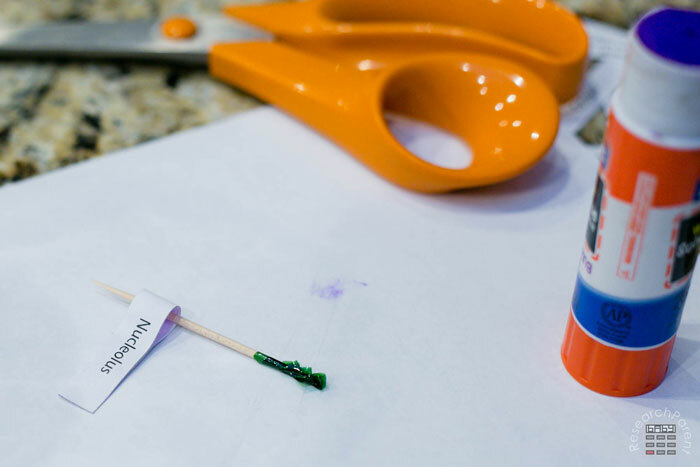 If you decide to follow the detailed, step-by-step directions in the tutorial below, you can use this list as an answer key to go along with these free, printable plant cell toothpick labels. 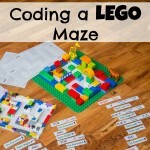 Kids can either use these labels to test their own memory or they can play a multiplayer game. Since I have 4 kids of very different ages, we played by putting all the flags in a small container. Then the kids took turns closing their eyes and picking out a flag at random. Because our toddler wants to be involved in everything the big kids do, he was allowed to put the flags wherever he wanted. Our only goal was to keep him from popping the water balloon! 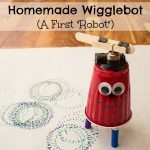 Cost: Free printable. Under $10 in used supplies. I used primarily things we already had in the pantry and fridge, but I did end up buying a small carton of blueberries and a box of gelatin. I recommend switching out items if necessary to avoid buying things if your family won’t enjoy whatever isn’t used. First, cook the 2 manicotti noodles and the lasagna noodle so they are soft by boiling them in water for a few minutes. 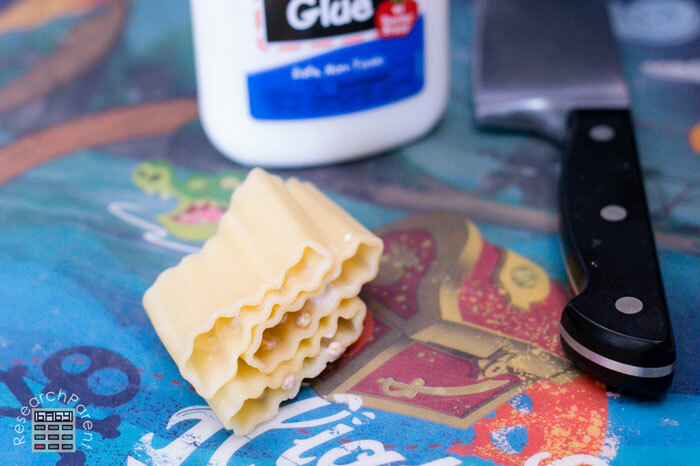 Use glue to fold and secure the lasagna noodle as shown. 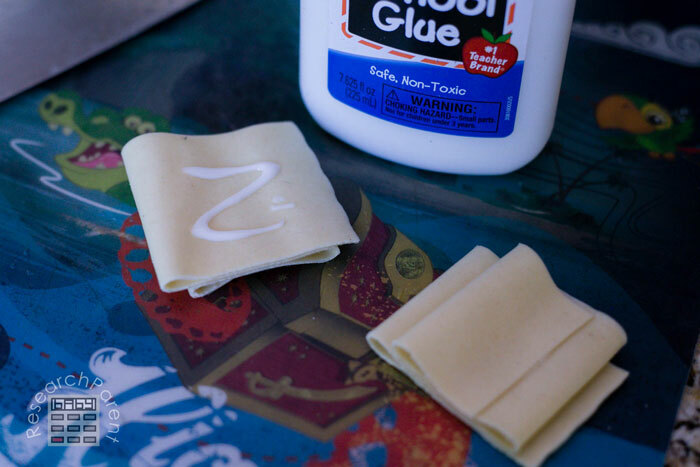 Wait a couple minutes for the glue to dry. 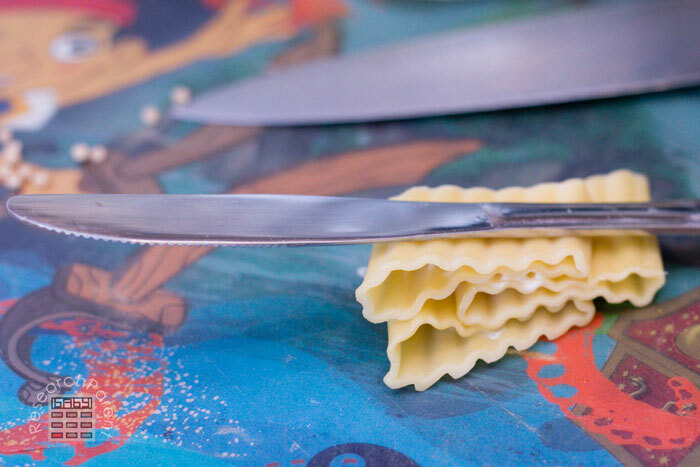 Cut the folded lasagna noodle in half. 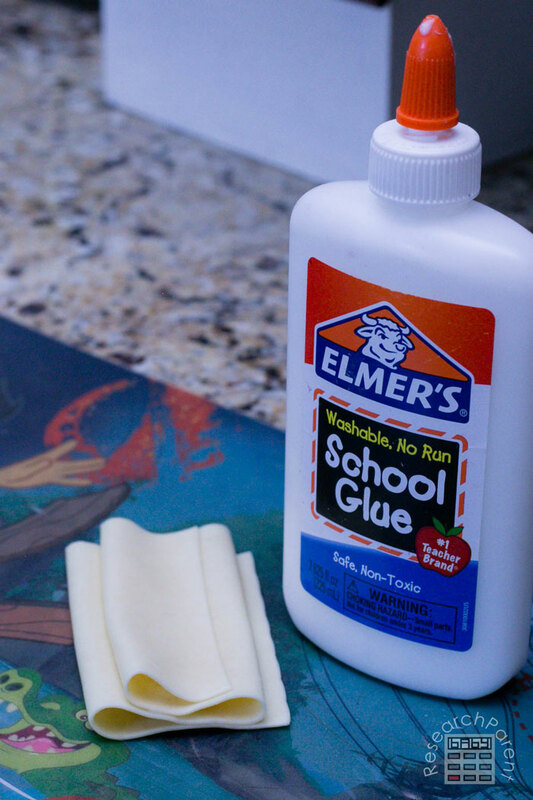 Apply glue to the larger flat sides of each half. 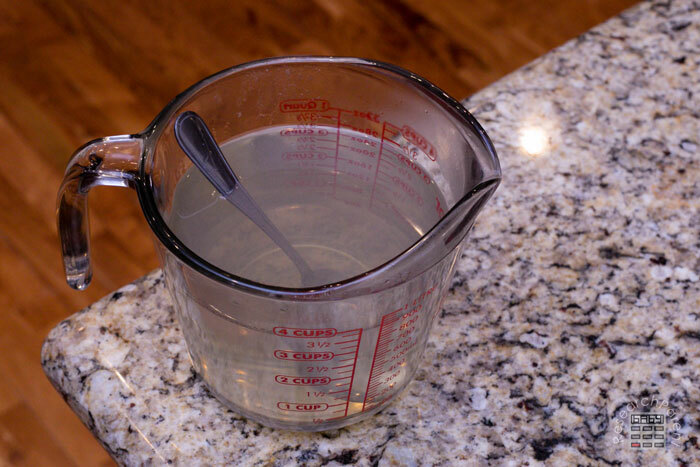 Measure 3 cups of water. Start boiling the 3 cups of water. 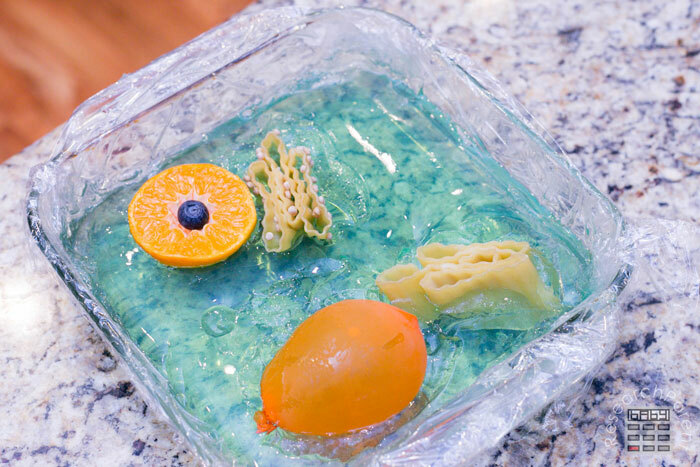 You can continue assembling other “organelles” while you wait for the water to boil. 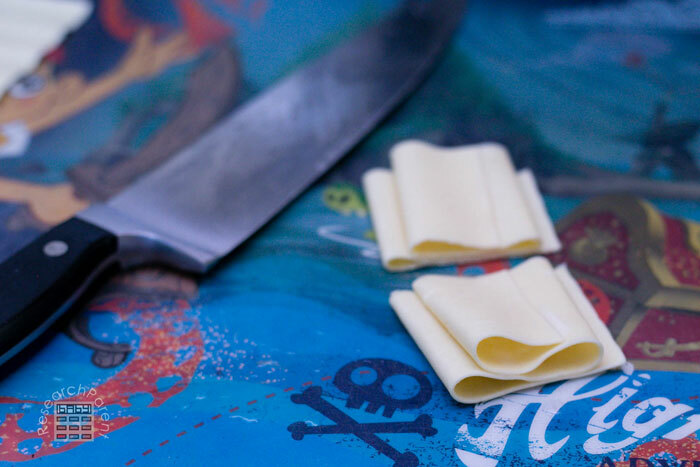 Cut a cooked manicotti noodle into 3 pieces. 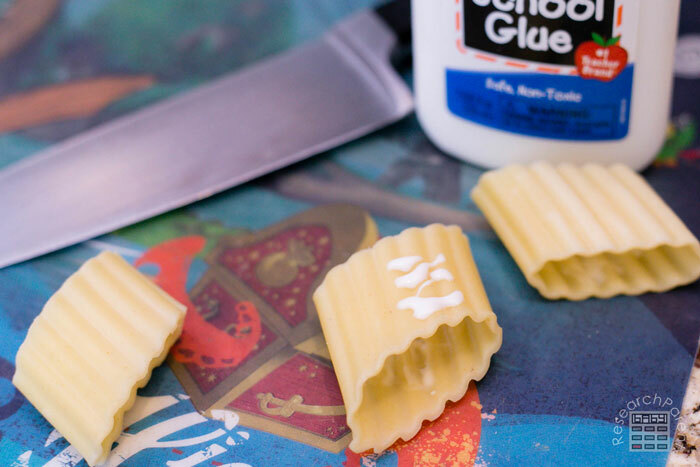 Apply glue to the inside of all 3 manicotti noodle pieces and the top of two. 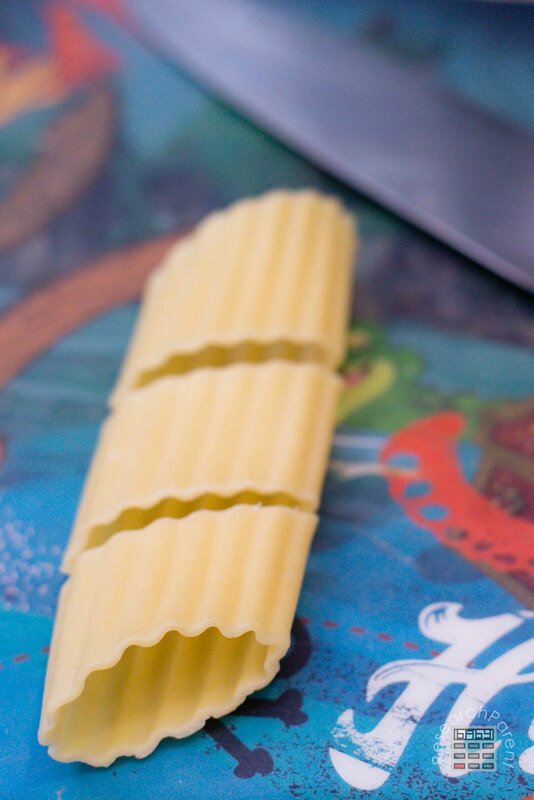 Stack the manicotti noodles together as shown. 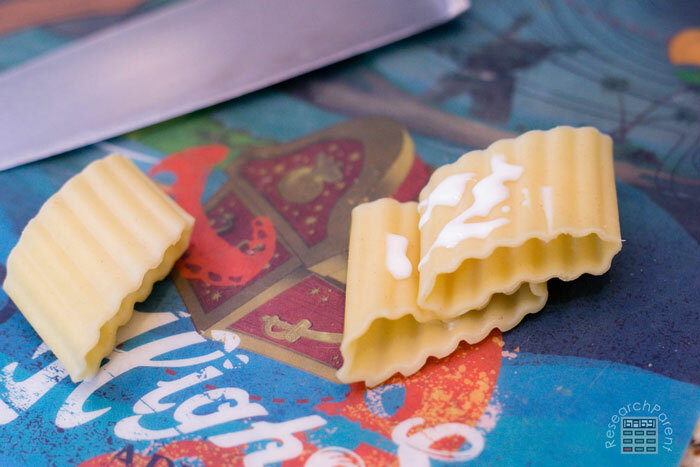 Place something heavy on top of the manicotti pieces and wait for it to dry. This is your smooth endoplasmic reticulum. Now we are going to repeat the previous 4 steps again, but this time, add pearl couscous. 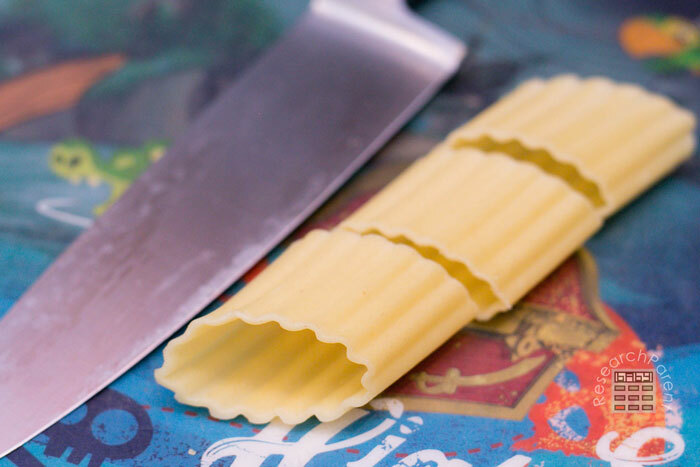 Start by cutting your second manicotti into 3 pieces. 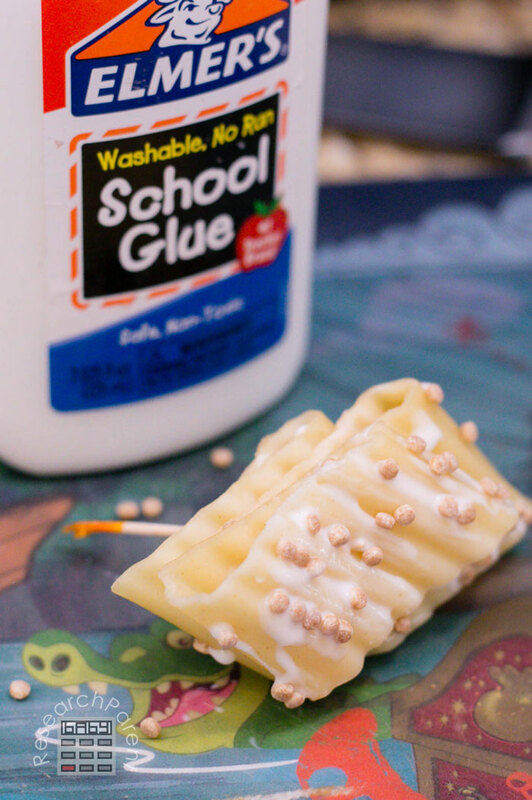 Apply glue to the manicotti pieces as before, but this time stick some pearl couscous on the insides and outsides. Stack them together, as before, adding pearl couscous. Put a toothpick threw the pieces to hold them together. 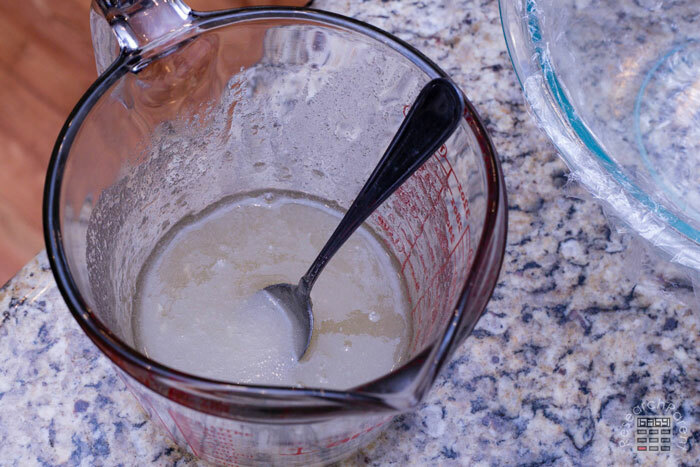 Add more pearl couscous to the outer surfaces with glue. 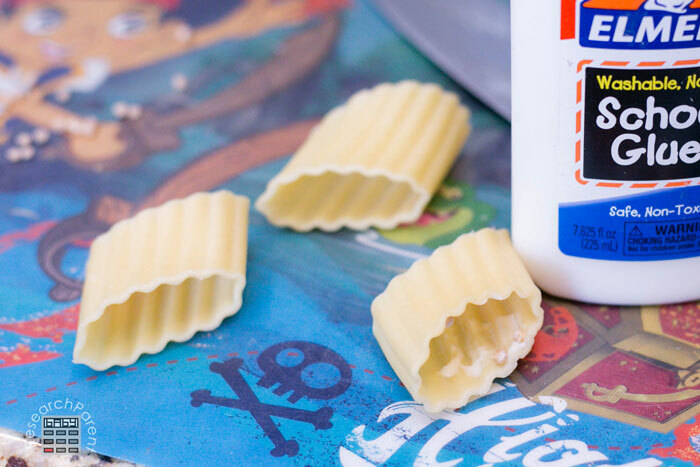 Don’t forget to add pearl couscous to the bottom of the stack of manicotti pieces. You now have your rough endoplasmic reticulum. 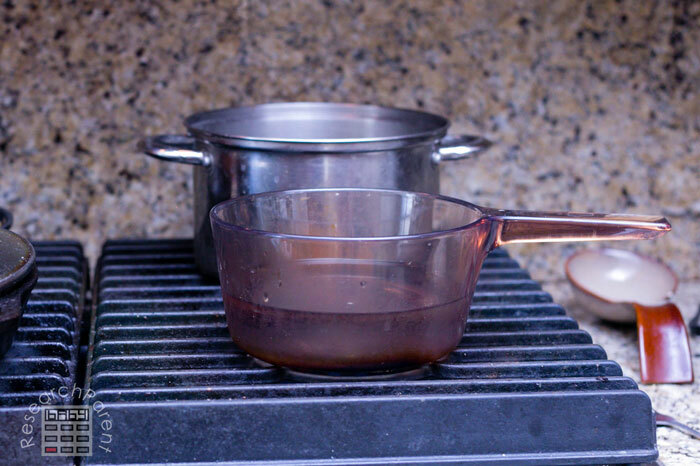 By this time, your water will probably be boiling. 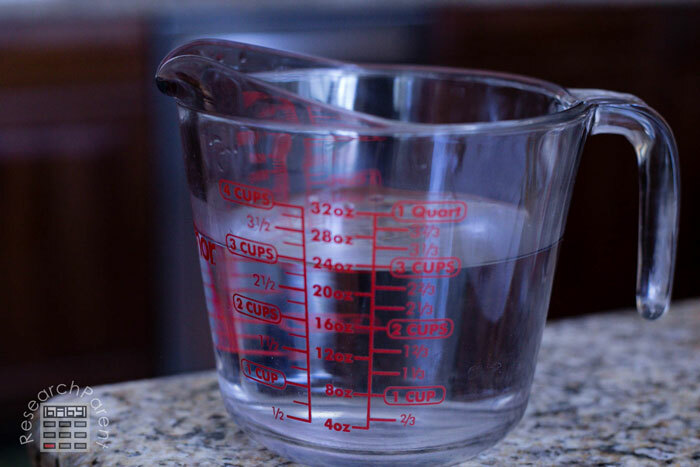 If so, measure 1 cup of water. 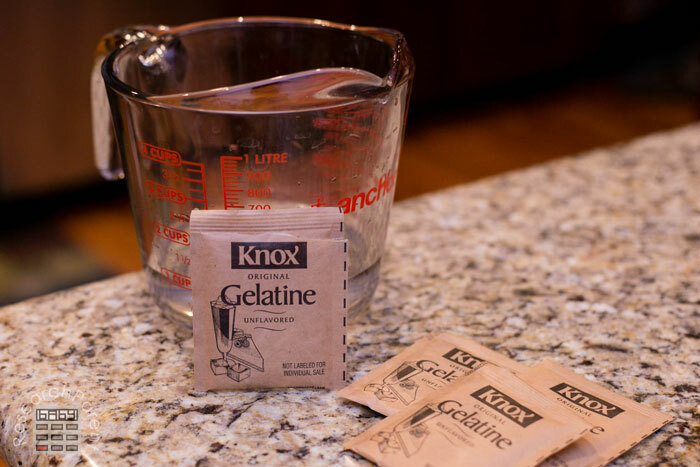 Add 4 packets of gelatin to water (if using Knox envelopes. 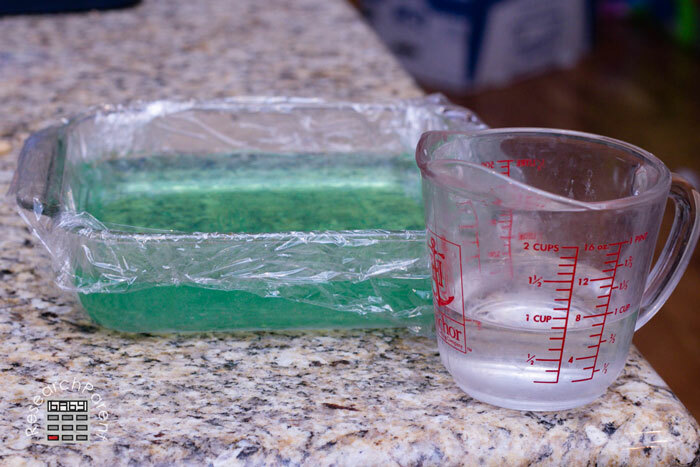 It not, check the packaging of your gelatin to figure out how much to add to 4 cups total of water.) Let stand for 1 minute. 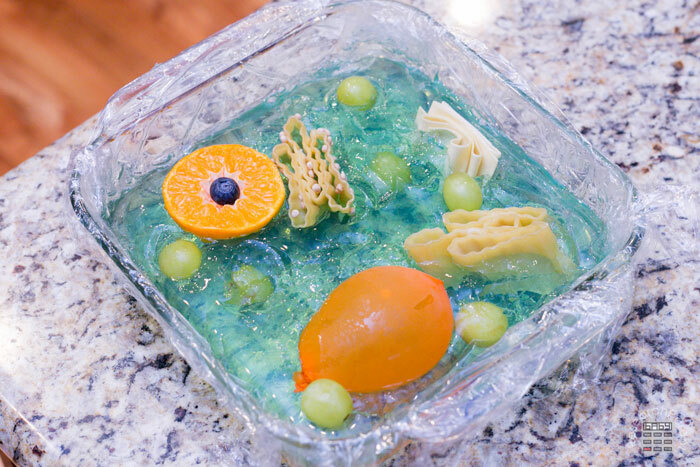 Stir the gelatin into the water. 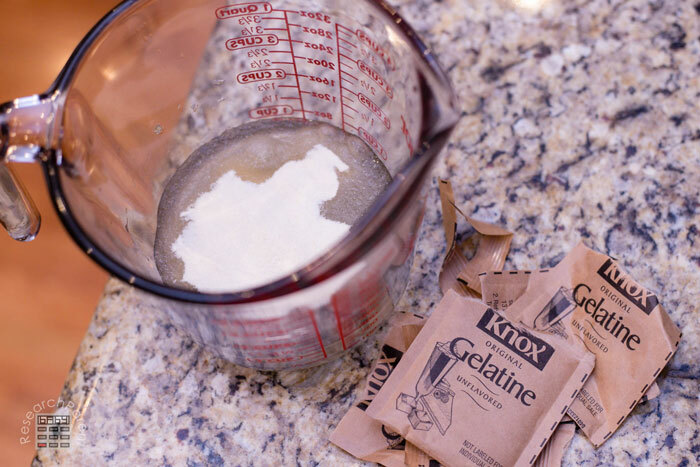 Add boiling water to the gelatin mixture. 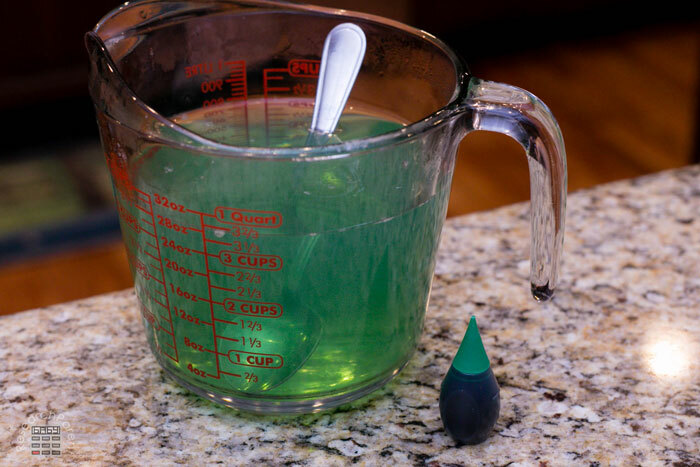 Add one drop of food coloring and stir. This is your cytosol. Note that when I was in school, we called this cytoplasm. However, the convention now seems to be that the word cytoplasm includes other structures such as ribosomes (couscous). 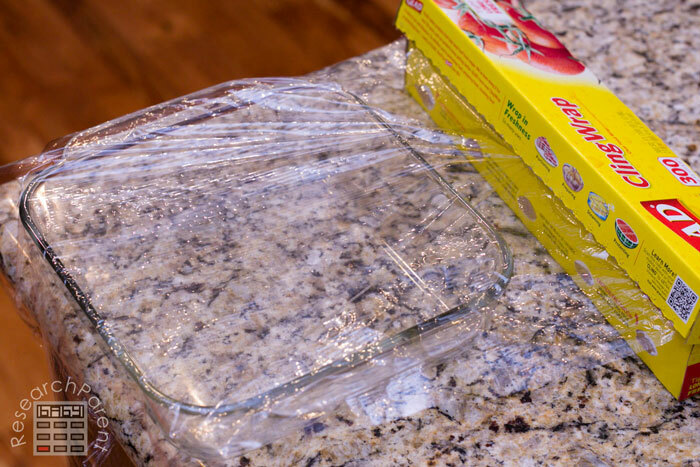 Use plastic wrap to cover your dish. You will likely need to use two pieces. The square dish is your cell wall. 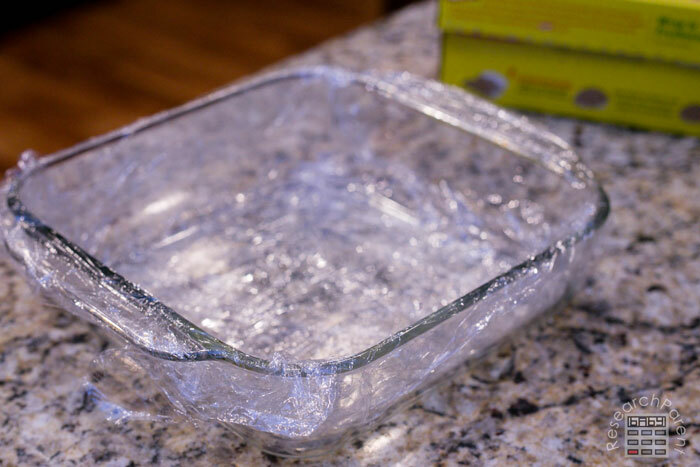 The plastic wrap is your cell membrane. 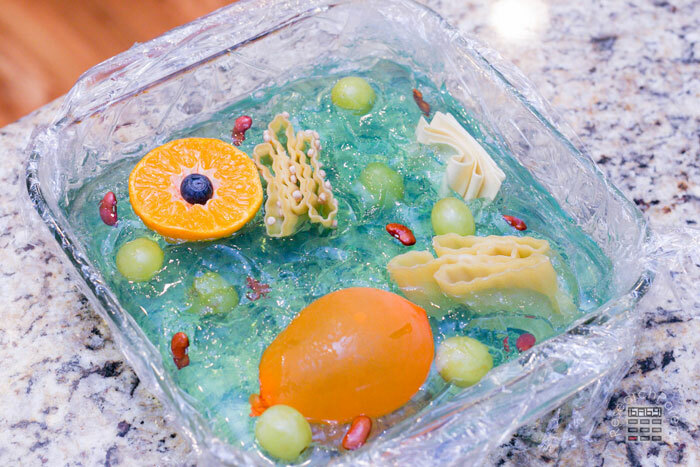 Pour the green “cytosol” into the bowl with the plastic wrap. You will probably want to let this cool off a bit before sticking it in the fridge. 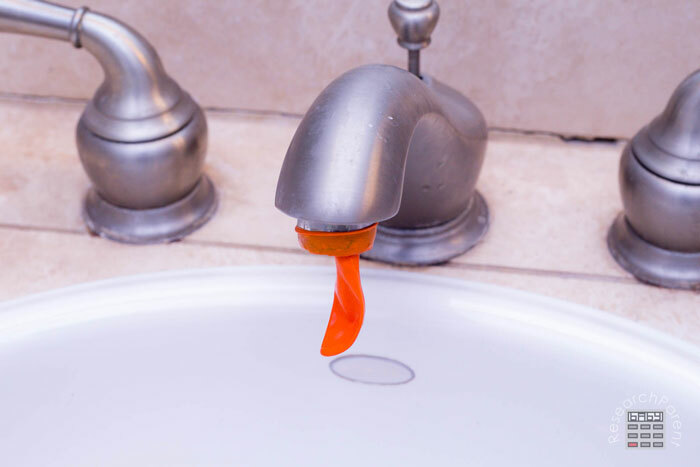 While you wait for it to cool off, fill up a water balloon. This will be your vacuole. 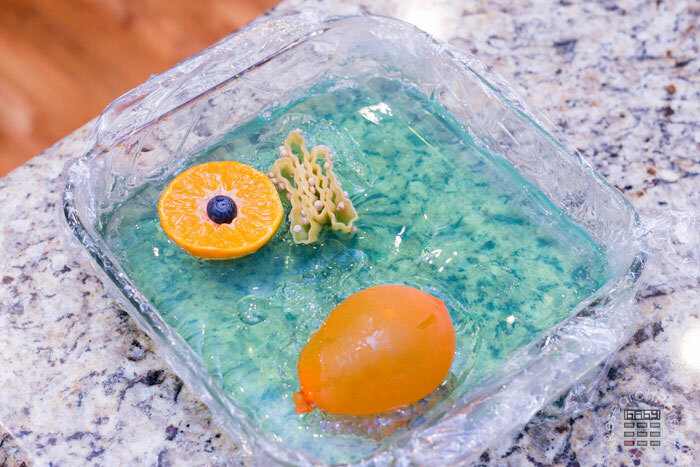 If you are going to make an animal cell to compare with your plant cell, make sure to fill this plant cell water balloon more than you did for the animal cell. A plant cell usually only contains one larger vacuole instead of a few smaller ones like an animal cell. 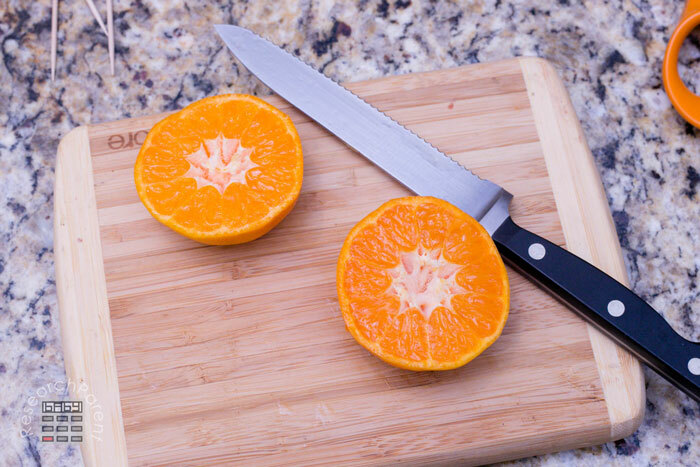 Cut a tangerine in half. 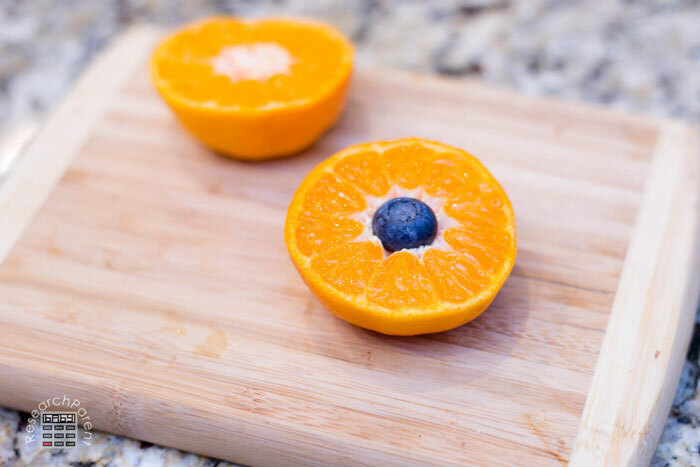 Place a blueberry into the center of the tangerine. The entire tangerine plus blueberry is the nucleus of the cell. The blueberry is the nucleolus and the tangerine peel is the nuclear envelope. Break up some pieces of spaghetti and angel hair pasta into 2 or 3 pieces. This will be your cytoskeleton. If you feel like the level of your “cytosol” is too low. Feel free to add a little more water. I ended up adding another cup of water. 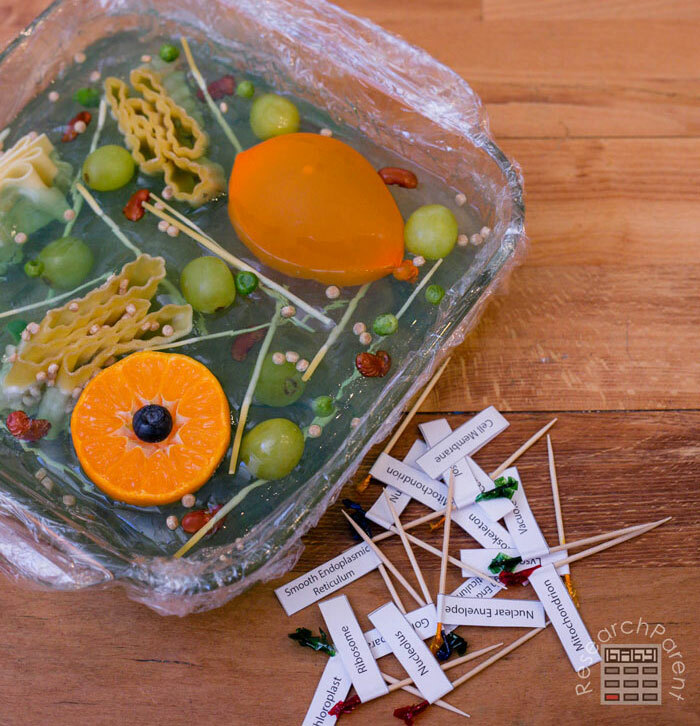 Check if your bowl with gelatin mixture is no longer hot. If so, place it in the refrigerator. CHECK THE CLOCK! 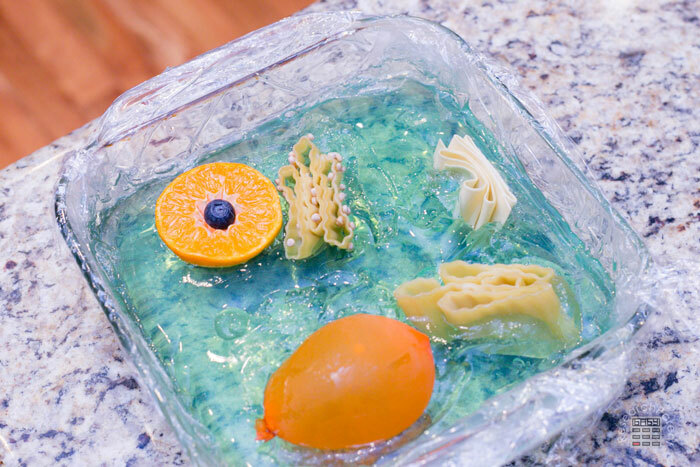 You will want to pull the gelatin out of the fridge BEFORE it solidifies. 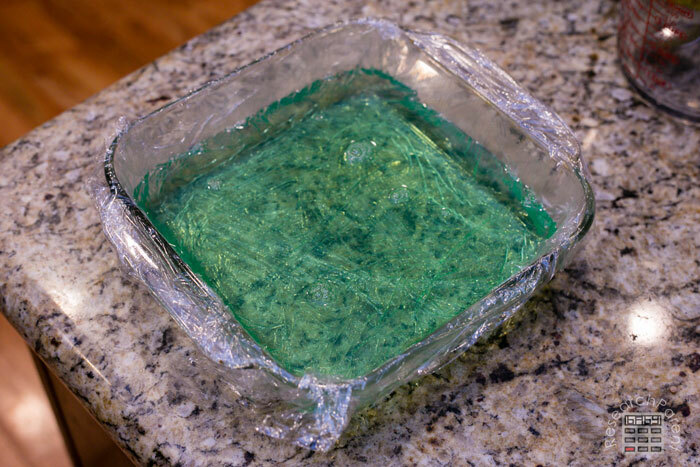 You want it to have started getting thicker, so that your organelles will not sink all the way to the bottom, but you also don’t want it to be so solid that you have to break the gelatin to insert your organelles. For me, the ideal time was between 45 and 55 minutes. Around the 30 minute mark, I would start checking every 5 minutes or so. (Note: even if you feel you’ve waited a little too long, I found that having it sit out on the counter for a few minutes while I inserted my food items was long enough for the cracks in the surface to “heal” themselves. 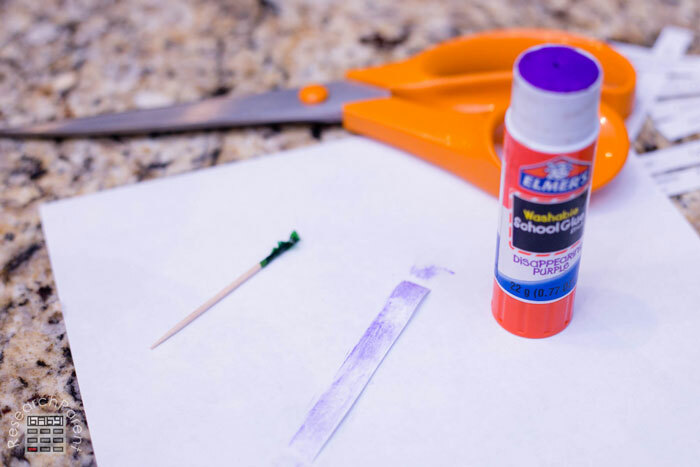 While you are waiting for your gelatin to gel, make your toothpick flags. 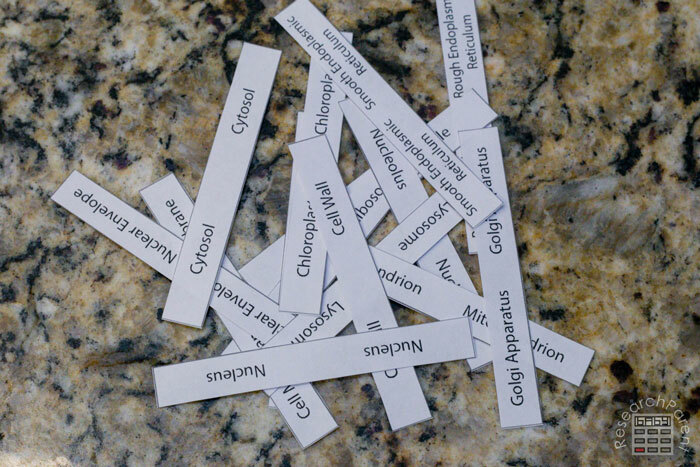 First cut out all the plant cell labels. Set the cell membrane and cell wall labels off to the side. Since you will want to attach these to the plastic wrap and glass dish, you do not need the toothpick. 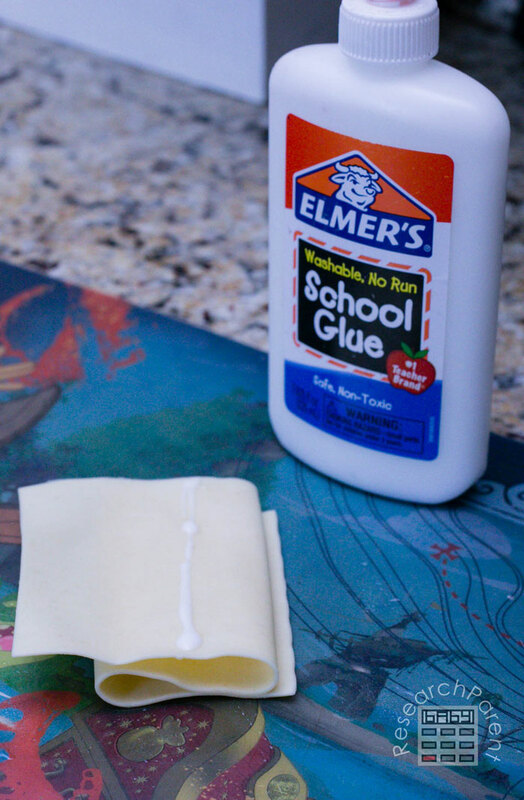 You can either use glue or tape. 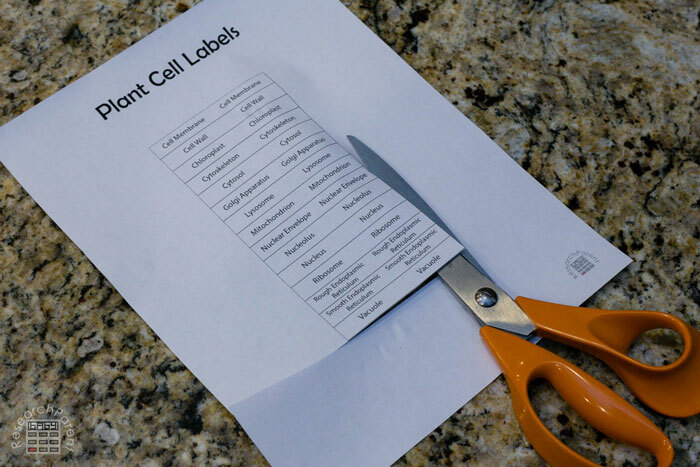 Apply glue to the back of a label. 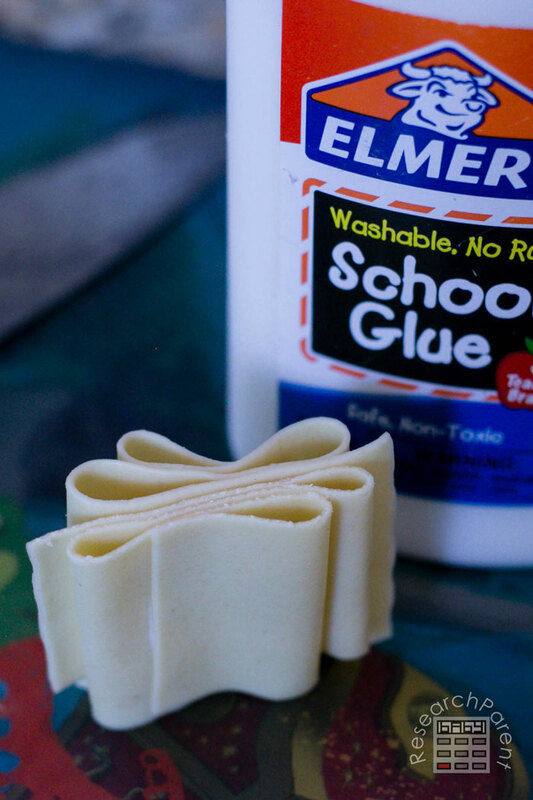 Fold the two sides together and stick a toothpick in the opening. 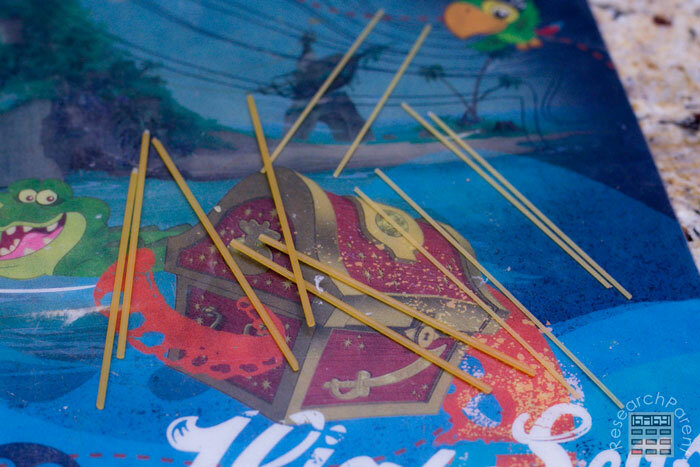 Secure the label around the toothpick and let it dry. Repeat for the other 12 labels (being sure to exclude the cell membrane and cell wall labels). 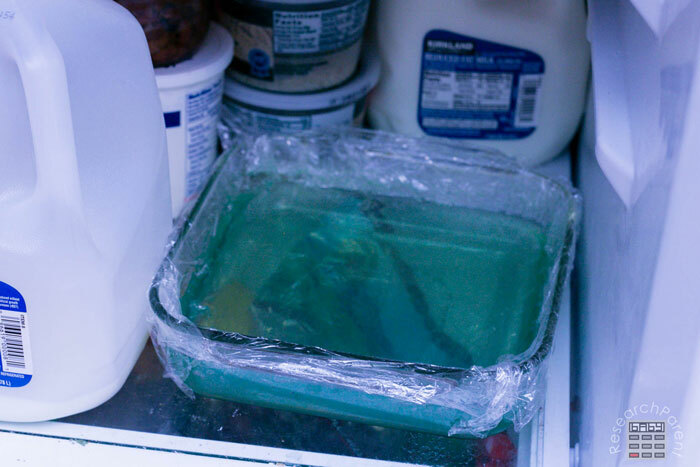 Once your gelatin has just barely started to gel, pull it out of the fridge. Note that the order of the next several steps is not important. 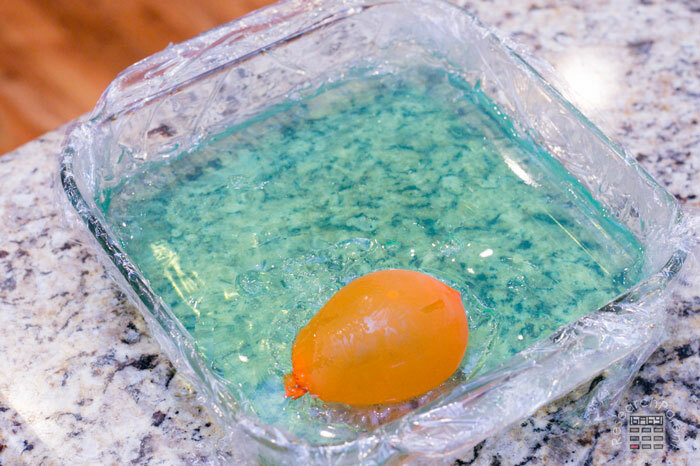 Add your water balloon to your cell. This represents a vacuole. 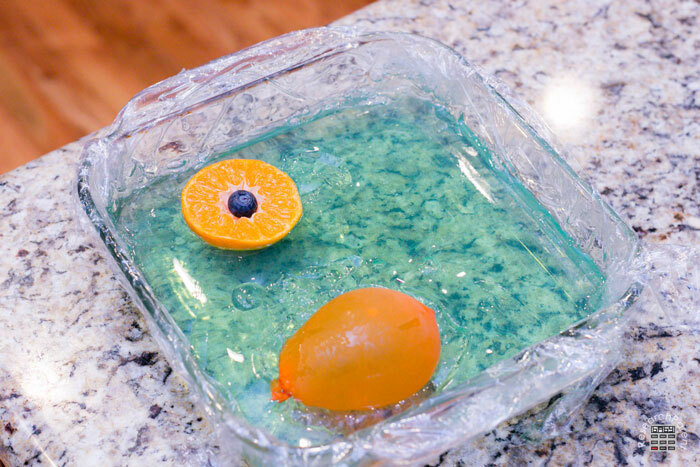 Add your half tangerine with a blueberry in the middle to your cell. 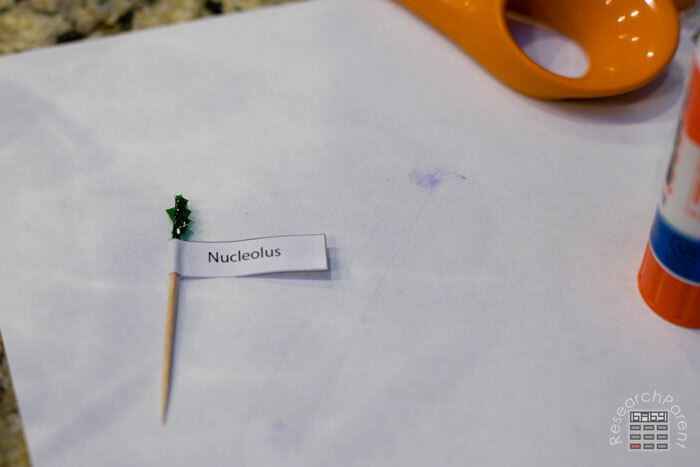 This represents the nucleus including both the nuclear envelope (the peel) and the nucleolus (the blueberry). Add the manicotti with attached couscous to the cell near the nucleus. This represents the rough endoplasmic reticulum. Add the manicotti without the couscous farther away from the nucleus. This is the smooth endoplasmic reticulum. 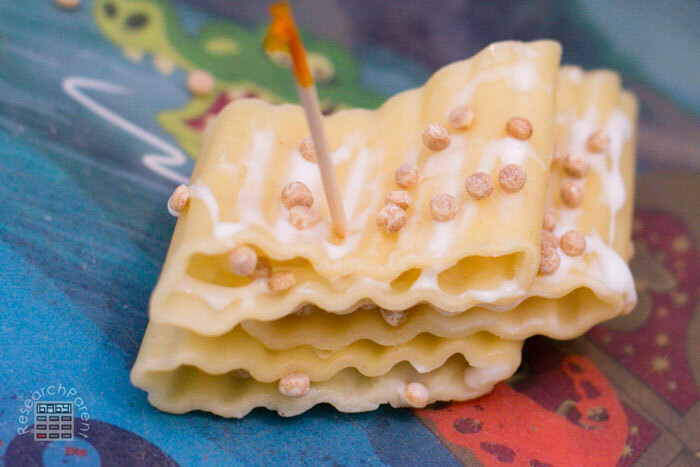 Add your folded lasagna noodle to the cell. This is your Golgi apparatus. Add some green grapes to your cell. These will represent chloroplasts. Add beans to you cell to represent mitochondria. Add couscous to your cell. These will be your ribosomes. 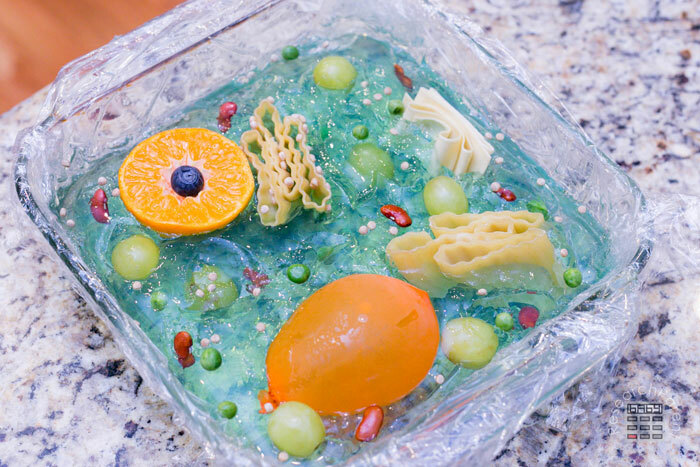 Add peas to your plant cell. 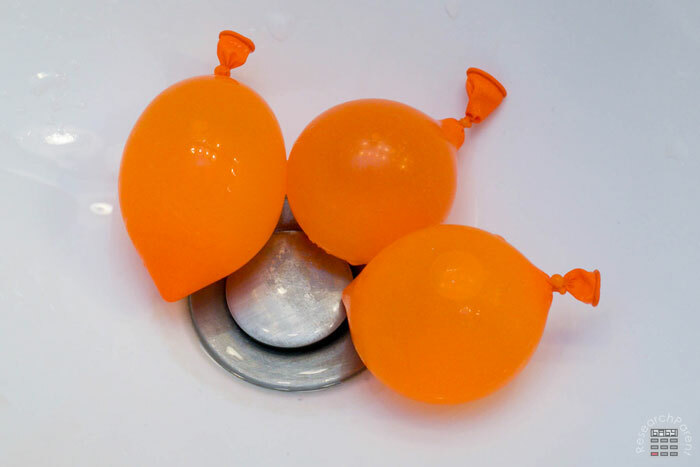 These represent lysosomes. 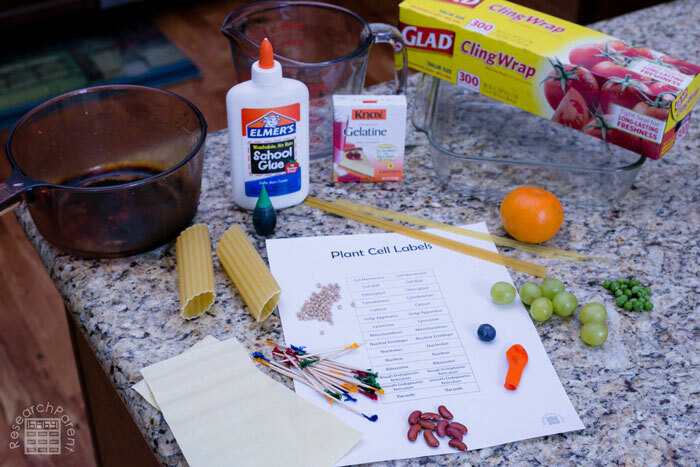 Add spaghetti and angel hair to the cell to represent cytoskeleton. Place back in the fridge for another 30 minutes or so in order for the gelatin to completely solidify. 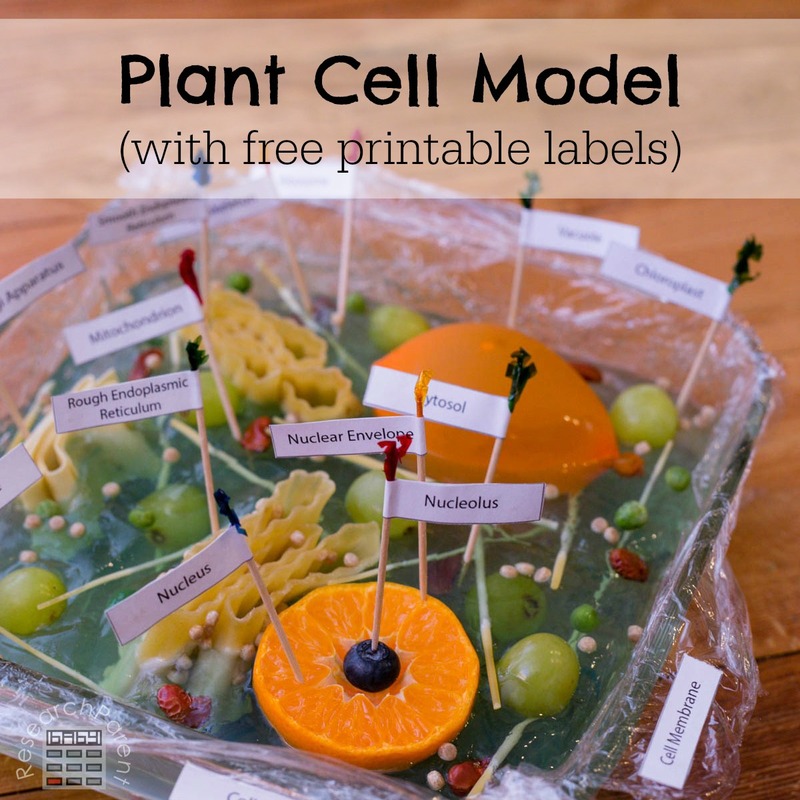 You now have a completed plant cell model! Now as you learn about each organelle, you can use your flags to label each part of the cell. 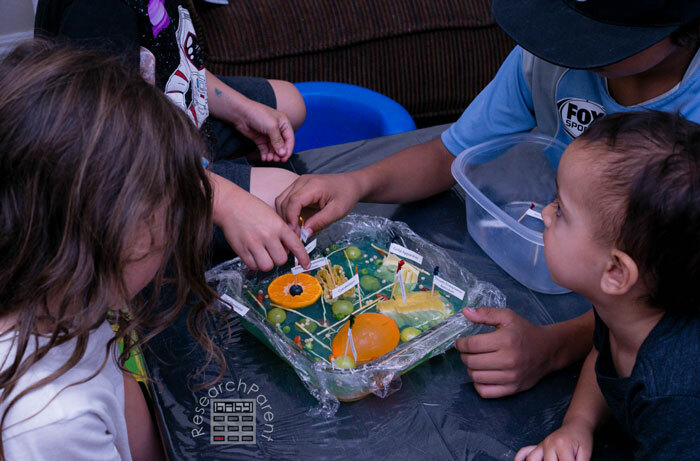 Kids can use the flags to test their own knowledge or take turns placing the flags to play a multi-player game. 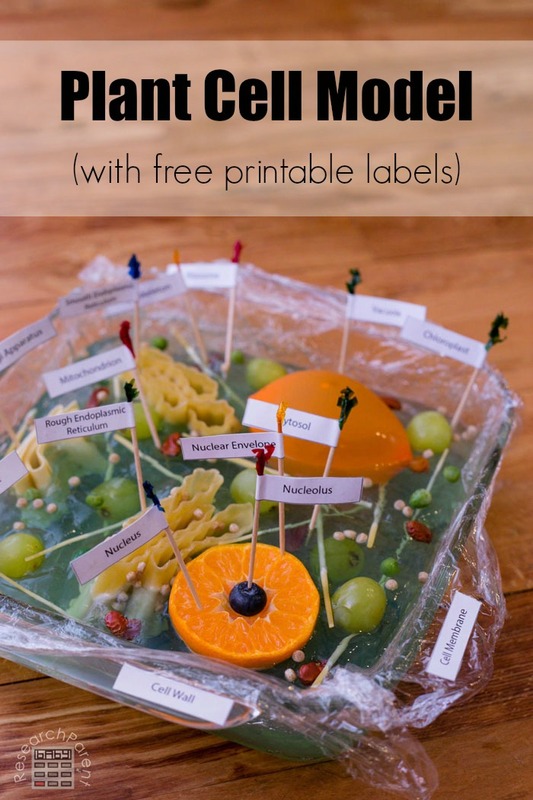 I hope your kids enjoy this activity demonstrating plant cell biology! 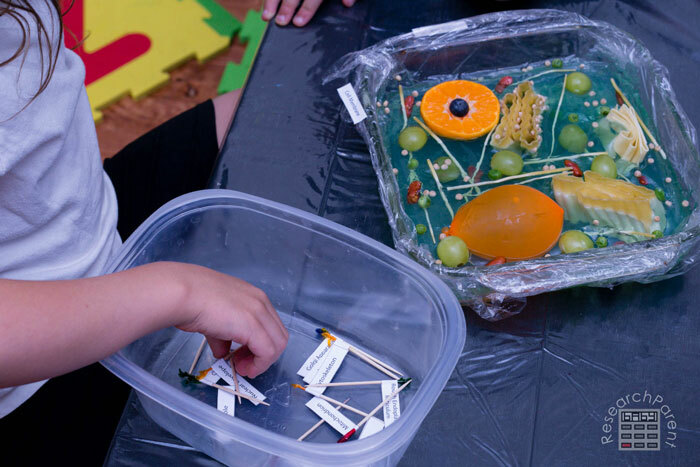 Click here for more Biology activities for kids.